Born into a family of seven. His father, Lee Hoi-chuen (Tony Leung Ka-fai) is a Cantonese opera actor and his mother, Grace Ho (Christy Chung), a housewife. Lee Jun-fan or best known as Bruce Lee was born on 27 November 1940. His name, “Bruce” was given by Dr. Mary Glover, who misheard his father’s pronunciation of the name. As a young boy, Bruce Lee has always been playful and mischievous. His attitude has never change even he becomes a young adult. His mischief behavior has always upset his parents. His truancy in school has become frequent and his street-fighting has also increased. His childhood best friends, Lau Kin Kong (Zhang Yishan) and Unicorn Chan (Jin Au-yeung) are always with him making them the fighting trio. Bruce Lee (Aarif Rahman Lee) always accept challenges and never wants to admit defeat has made him an arrogant person. But he will never let his friends nor abandon his friends when they are in trouble. Besides street-fighting, Lee enjoys dancing cha-cha. He even participated the competition with his youngest brother, Robert Lee (Dylan Sterling) and won the tournament as The Best Pair. Soon, Lee gets involved with stage set and meet with some notable actors such as Shek Kin (Chin Kar-lok), Tso Tat-wah (Cheung Siu-fai) and several other actors. Lee has also decided to pick up martial arts to improve his fight skills that he seeks out Master Ip Man (Wong Chi-Wai) at the Wing Chun Association. There, he begins his training to practice Wing Chun, because he plans to defeat Charlie Owen (Alex Yen), who proposes a match. One day, Kin Kong secluded himself from him because of his jealousy of Lee’s getting closer to his then girlfriend. Kin Kong becomes a drug abuser and no longer keeping in touch with his family because he feel ashamed. When Lee finds his whereabouts, he tries to bring his friend back but was halted by the corrupted police, who is also a drug lord. His friend who is guarding at the bottom rushes to get the police to the scene. Lee stirs up a commotion while running away from the drug lord and his crooks. When Lee was surrounded, Kin Kong sacrifices himself to save Lee from the drug lord. Kin Kong falls to his death. The drug lord’s lair has been surrounded and because of Lee’s involvement of putting many of the drug pushers and makers arrested. The triad leader behind the whole business is not going to let Lee go. So, Lee’s father decided that Lee should keep his silence and behave himself while living in a foreign land. Lee bids farewell to his family and siblings as he leaves Hong Kong for United States. November 27, 2010 commemorates the legendary martial artist, Bruce Lee’s 70th Birthday. Bruce Lee, My Brother is directed by Yip Wai-Man and co-produced by his younger brother – Robert Lee and Manfred Wong Man-chun. Robert provides an in-depth storyline on the Lee family values and cultures while focusing on Bruce Lee’s childhood years to his adulthood as an actor and martial artist legend. 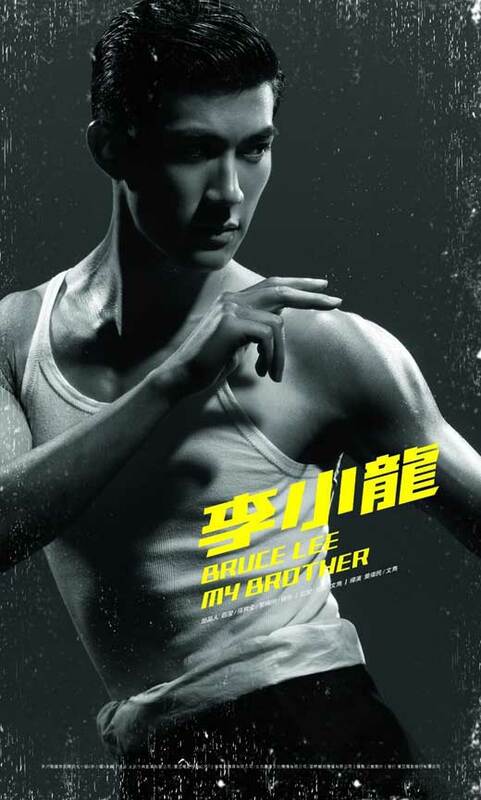 Newcomer Aarif Rahman Lee, who bears the same surname starred as Bruce Lee along with Tony Leung Ka-Fai and Christy Chung as Lee Hoi-chuen and Grace Ho as Bruce’s parents. The 23-year-old lad is a mixed parentage of Malaysian-Chinese-Arab descent from his father and his mother is a local Hong Kong citizen. “He was a very charismatic young man when what most people know about him was his fighting. But actually there’s much more of Bruce Lee,” Aarif Lee said. Unfortunately, this movie is failure. Despite reviewing his teen years before fleeing to United States because he becomes a national hero in eliminating the drug lord has cause the triads to chase after him. There’s really nothing much about him. It’s just partial of here and there. I do not blame the movie nor Robert Lee, because he was only a child. This entry was posted in Biopic, Martial Arts Film, Movies Genre and tagged Aarif Rahman Lee, Abe Kwong, Alex Man, Alex Yen, Andrew Nelson, Angela Gong Mi, Bruce Lee, Candice Yu, Chan Kwong-Wing, Charles Ying, Cheung Siu-fai, Cheung Tat-ming, Chin Kar-lok, Christy Chung, Dylan Sterling, Frankie Ng, Hanjin Tan, He Xinwei, Jennifer Tse, Jin Au-yeung, Ken Lo, Kristy Yang, Lawrence Cheng, Lee Heung-kam, Michelle Ye, Raymond Yip, Tony Leung Ka-Fai, Wilfred Lau, Wong Chi-Wai, Zhang Yishan. Bookmark the permalink. This is pretty much the same story about Bruce’s childhood I read way back in the 70’s nothing changed. Today 05/09/2011 I am still sadden by his death. I was born in South America and from Bruce’s time in his peek to now, there isn’t any Martial Artist who grabbed my attention for 2 minutes. The world has lost a True Martial Artist one we will never see his talent again. Gone forever!! !